Do you remember having to wear those silly looking water shoes growing up? Parents or grandparents would always warn that it was because community splash pads or public pools are filled with germs. Well, today we’re adding another place to that list. In April 2017, an anonymous listener from Texas contacted “The Rod Ryan Show” on Houston’s 94.5 The Buzz about the importance of wearing shoes in public showers. The Texan man’s warning came after he caught a flesh-eating bacterial infection on his foot. “It started while I was training for my first ever half marathon. Over my lunch break, I would make a point to go to my local gym and run for a bit. I had never run such a long distance before, so I wanted to make sure I was ready. 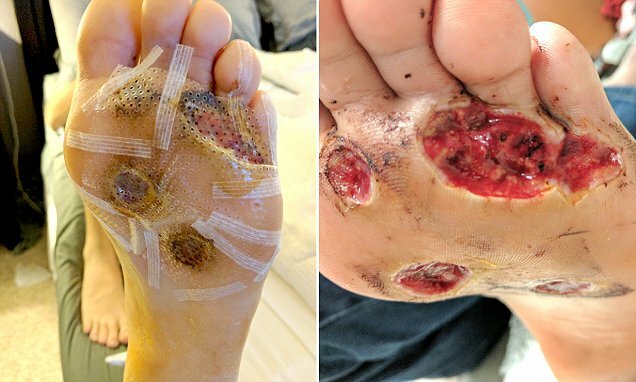 Shortly after showering without flip flops or water shoes on, the man noticed a single plantar wart on the bottom of his foot. However, that one wart quickly morphed into five. The doctor told him that these plantar warts (i.e., benign foot tumors) were caused by the human papillomavirus. Over the months, these seemingly harmless warts turned into open wounds. When he finally did go to see a doctor, they started him off with a cantharidin treatment. The cantharidin treatment – even at higher concentrations! – would not work. After a few excruciating months where his foot would grow so swollen he couldn’t walk, he finally opted for skin graft surgery. As reported by The Rod Ryan Show, the grafts were made from North Atlantic Cod. After the skin graft trial, his open wounds finally started to close up and heal. Although, it took about three months for him to start walking on his own again.